Getting an Ergotron WorkFit? Do you know the pros and cons? 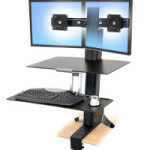 The WorkFit line, from Ergotron is a product line of standing desk converters that allow the ability to stand and work. When one thinks of overtly strenuous occupations, sedentary forms of work that involve a lot of computer-based activity are probably the last entries on their list. After all, how difficult and taxing can typing really be? As it turns out, the answer is more complex than it might first appear, and given the sheer scope and prevalence of computer-based work in modern society, certainly more important. Indeed, the issue here isn’t simply one of “hard or not hard, difficult or easy” – it’s one of overall workplace productivity and one’s physical and mental health and well-being. Happily, the folks over at Ergotron understand that, which is why they offer a wide range of tools designed to reduce the unique stresses placed upon workers whose jobs demand that they remain sedentary for extended periods of time. One such product, or rather product line, is the company’s Workfit collection. 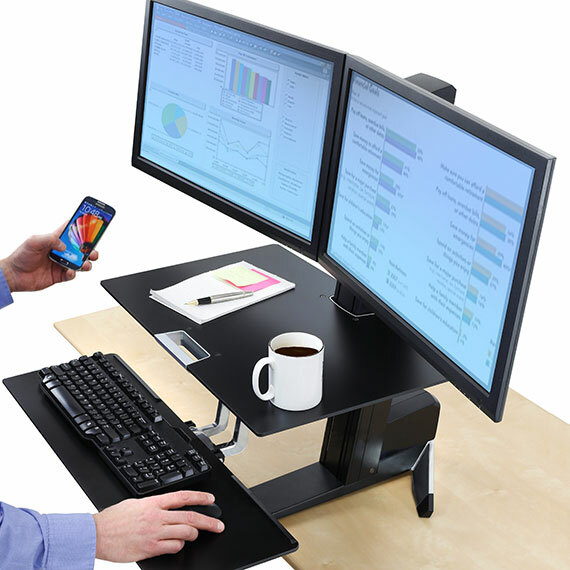 Made up of innovative sit/stand desktop attachment systems, the Ergotron Height-Adjustable Desktop Attachment kits make long-term sedentary work more healthy, more productive, and more fun! Want to get a look at three of the best products in their line-up? Keep reading! Reviews and comparisons for each are below. This is the best of the bunch. You will really like the fact that you have the ability to adjust the height of the keyboard and monitor separately allowing you to get the best ergonomic fit. If you do not like the front mounting of the WorkFit-S, than this is the model to go with. 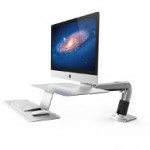 It is very flexible and easily adjusts to either sitting or standing. I also like the fact that this unit can be pushed out of the way when you want to work on papers/files, or anything else that requires a large workspace. 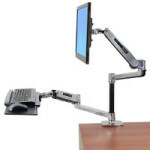 The WorkFit-LX combines Ergotrons LX Monitor arms with a Keyboard and Mouse Tray/Arm. This allows you to move each independently and adjust for both sitting and standing. The first Ergotron WorkFit dual sit/stand workstation under review in this series is the Workfit-S, aka the WF-S. Unlike the WF-LX, height adjustments are made through the combined use of a counterbalancing system and a pedestal. 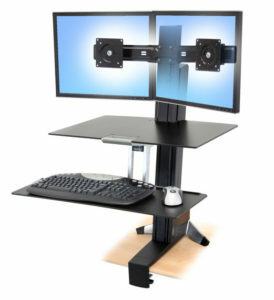 The counterbalance system raises or lowers the user’s keyboard / desk and their workstation’s display(s) simultaneously (there’s an 18 inch / 46 cm spread), while the pedestal itself allows for another 5 inches / 13 cm of vertical movement for the display. To clarify, the display, or rather displays, since the WF-S is a dual-monitor setup by default, is attached to the pedestal, while the keyboard is situated underneath the desktop, which occupies the middle ground, as it were. The ideal load for this unit is 28 pounds or less (or 12.7 kilograms); the Workfit-S has an upper weight-bearing limit of 32.5 pounds / 14.7 kilograms. Installation, meanwhile, is a simple process, although it should be noted that only two mounting positions exist: front-of-desk or via grommets. While this rig is of high quality and utility overall, it does have one glaring drawback: Like the Ergotron Workfit LX below, this Ergotron machine fails to accommodate Apple displays, which effectively shuts out many creatively-focused workplaces who could otherwise benefit greatly from a tool like this. On the other hand, one would be hard-pressed to find a Windows / PC model display that the WF-S can’t be mated to. The second entry on this list is unique in its ability to accommodate Apple products. This is great news for creative professionals and others whose workplace environments favor Macs and their plethora of related displays and peripherals. The rub – roses and their thorns! – is that this model is billed (and thus priced) as a premium offering. Given Apple’s own reputation as a purveyor of luxury products, this should hardly be surprising. Aside from the WF-A’s unique brand allegiance, it mirrors the WF-LX rather closely. In fact, once brand is removed from the equation, the only real difference between them lies in their individual load-bearing capacity. The Ergotron WorkFit-A is a bit more petite than other models reviewed on this list; it is advised that the weight of displays and related items not exceed 20 lbs. / 9.1 kg, whereas the WF-LX is specced for 30 lbs. / 14 kg. In any case, the WF-A’s maximum load-bearing capacity is 25 pounds (11.3 kilos). Regarding height adjustment parameters, the WorkFit-A can be raised or lowered through a range of 20 inches / 51 centimeters in either direction (so as to adapt to multiple users’ sit / stand preferences or “profiles”), while the dual displays themselves can be rotated through a five-inch (13 centimeter) viewing arc for optimum visibility in all light conditions. One final note about the WF-A: For users who wish to alter the WF-A for PC-only use, the removal of the iMac-specific adapter (used for mounting the iMac / Apple display) is all that’s required. All other specifications remain the same. Truly, the adapter’s presence or absence – and the absence or presence of an iMac display – seems to be the only real difference between the WF-A “premium” and the standard edition of the unit. The final WorkFit on our list of reviews is the Ergotron Workfit-LX, or the WF-LX for short. Obviously, the point of this apparatus is to allow the user to seamlessly switch between seated and standing positions while at their desk. The WF-LX accomplishes this through the use of an articulated arm to which a computer monitor or related display is attached. Raise or lower it at your convenience, and the display will raise or lower to a height appropriate for standing or sitting. As for the keyboard, mouse, and related peripherals, users can choose where they want them to be – either in a traditional desktop layout or, provided that one’s desk has a tray, in an underslung configuration. Similarly, while it is a single-display tool by default, the Workfit-LX can readily hold dual monitors when used in conjunction with the required mounting brackets. Regarding physical constraints, it is important to note that some limitations exist. Installation, for example, is quite easy, but there are only three real options when it comes to mounting the Workfit-LX – the back of a desk, the side of a desk, or a conveniently located grommet. Weight, meanwhile, is also an issue. Optimally, the load borne by the WF-LX will not exceed 25 lbs. (or 11.4 kg), with loads of 30 lbs. / 14 kg constituting the rig’s upper threshold. Finally – and this can be a big problem depending upon the workplace in question – the Workfit-LX is not Apple-compliant. In other words, unlike some of the other products on this list, the WF-LX cannot be expected to safely or effectively mount Apple-brand displays or related products, and any attempt to do so will probably result in damaged or destroyed products, workplace injuries, and other such unpleasantness. The good news is that virtually all PC / Windows displays and related items are perfect for use with the WF-LX. NOTE: While height ranges, viewing angle ranges, and so forth are listed for the other Ergotron models reviewed on this list, the relevant data for the WF-LX is currently unavailable. Ergotron’s WF-LX web page promises a forthcoming update on the WorkFit-LX’s viewing metrics, including all relevant distances, screen-sharing capabilities, and the like. Until such time as these are provided, it should be assumed that this model is at least as mobile as the other rigs reviewed on this list. And there you have it – three of the finest sit/stand modular workstations on offer from Ergotron. Users will notice an immediate improvement in their workplace performance, as well as their own overall health and stamina. The reviews offered here are a sincere attempt to outline all of the relevant pros and cons of each listed model, as well as how each might best be used. The only way to truly test these machines and the claims made about them, however (and thus, to find the best Ergotron WorkFit model for yourself and / or your workplace), is to try one for yourself!